I often ask God to direct my steps. My prayers regularly include requests for him to show me an opportunity to do something I think he wants me to do. Because I’ll do it, I just want to know that its his direction and his timing. And he does it. Right before my eyes, he will give me an opportunity to do something he wants done or say something he wants said. Every time one of these opportunities presents itself, I have to take the first step of faith forward, not knowing what the next step is and never knowing how this is all going to work out. I just have to take that first step and obey. So the story of the Israelites crossing the Jordan into the Promised Land is special to me. God told the priests carrying the Ark of the LORD to go first. God told them he would make a way for them but, first, they had to step into the Jordan which was running at flood stage. The overflowing water of the Jordan river was roaring down its path…..
and they had to step in. An act of faith. An act of obedience. As soon as the priest’s feet touched the water’s edge, the water stopped flowing. They had to commit and then they saw God respond. In the middle of a rushing river, God opened up a path for them to the Promised Land. This is significant. Too often we want to see God move in our lives but we haven’t stepped out in faith. We haven’t stepped up to the plate in obedience of the things we already know God wants us to do. Jesus told us clearly, “Love God and love others.” These are the two main things I need to be about – I already know that. When I am focused on doing these things, I see God part the waters for me. He blesses my last step and reveals my next step. But the first step of obedience is mine. Where is God asking you to take that first step of obedience? Go ahead – step into the water and watch it part in front of you. It will be worth it. 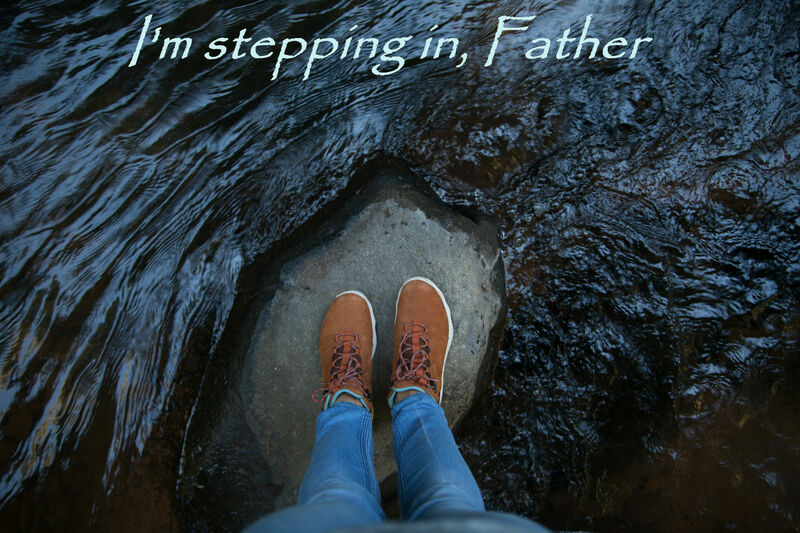 I believe, Abba Father, so I’m stepping in.